The Trojan Inn recently celebrated its 50th anniversary, operating first on the Toledo square and in its current location since 1994. That is a long time in any community, and this small cafe has some clear staying power. 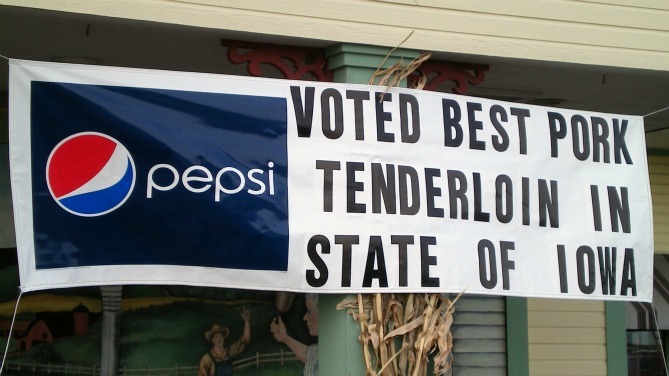 A recent write up in the Cedar Rapids Gazette claimed visitors from other states would return to the Trojan Inn to buy tenderloins. 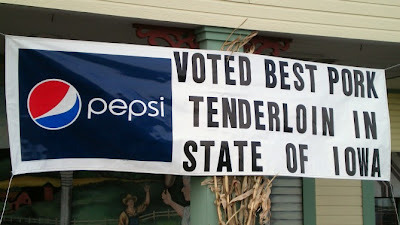 Another local paper gave the Trojan Inn an award for best tenderloin in the area. Directions: E High runs south of the square, and the cafe is half a block east of the Courthouse. Toledo has some odd traffic lights attached to the ground in the middle of the street, so be careful. The Tenderloin: The lady serving me claimed that these are usually wider, but the preparation and tenderizing was done by an old lady who couldn't hit the pork loin as hard as she used to. I really didn't know what to think about a story like that, the loin looked perfectly huge already. It felt like eight ounces of pork in a triangular cut of loin meat. 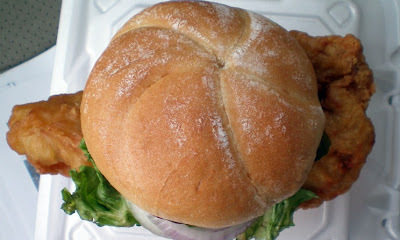 The breading felt thick and crunchy but had little seasoning. The edges were a little dry to my taste. Overall 7.0 out of ten. Also on the Menu: There is a large menu of scratch cooking that included burgers, melt sandwiches, ice-cream and a full breakfast selection. There was a window fridge with homemade pies to choose from that looked great. Service: It seemed to be just a couple old ladies working when I was in. One was waiting tables, the other was cooking. Ambiance: This is another place that is clearly old but the current location hasn't been a restaurant for too long. There is an old counter and aging woodwork along with wood paneled booths for seating. Final Thoughts: I always sympathize with the small cafes that have the bad luck of a casino opening nearby. The casino hits a local place two ways: first by taking the disposable income of so many locals, secondly by opening competing food places that serve at below cost as competition. Its a hard time finding good places to eat in the many casino towns. I recently read the visually iconic King Tower Cafe in Tama has come under new ownership. My last visit didn't go so well, but it may be time to try it again. 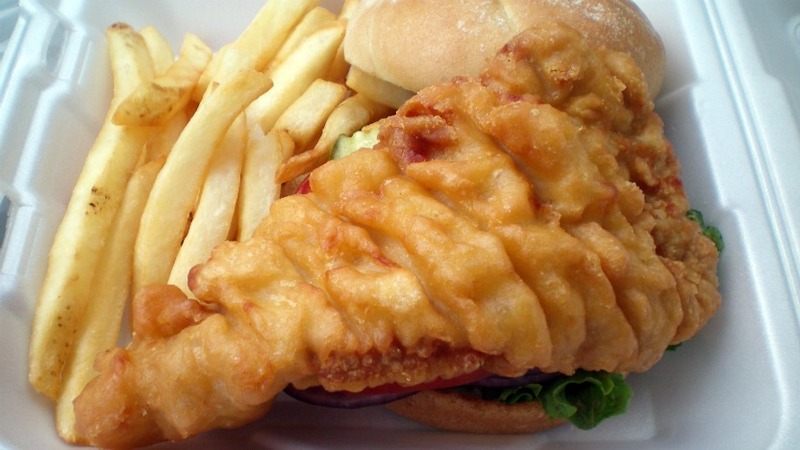 I have found my fair share of battered tenderloins while driving through Iowa. 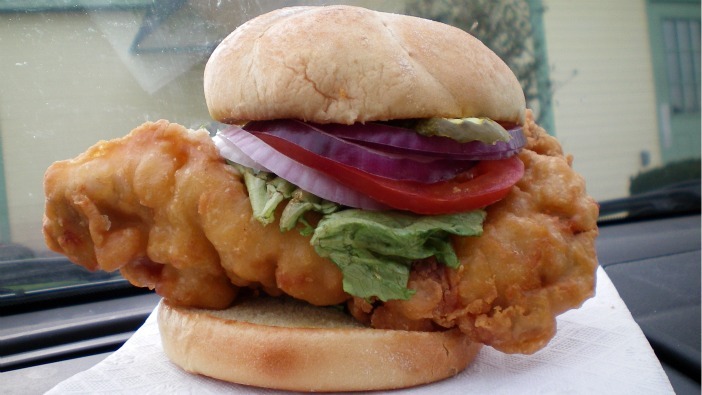 The slight difference in texture and crispiness sets them apart from the breaded tenderloin sandwiches. The pictures come out a little different because of the smoother surface on the batter coated pork loin. 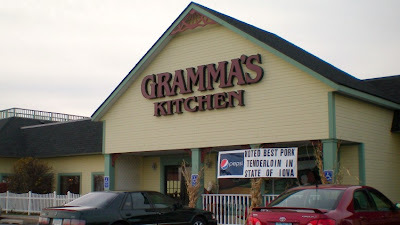 Gramma's Kitchen in Walcott was voted your 2011 IPPA Best Tenderloin in the State of Iowa, and it is described as "famous" on their menu. Location: 3408 N Plainview Rd in Walcott, Iowa just outside Davenport next door to the World's Largest Truck Stop. Directions: This is on the north side of the Interstate at exit 284, Across from the giant truck stop with a giant sign you can't miss. The Tenderloin: Getting this in a to-go box, it opens up like a package of fish-n-chips with a giant battered strip of pork stretching across the container. The meat felt like a seven ounce triangle of pork that took a great shape after being battered and fried.You can see in the picture that the loin formed something of a curled up shape that held the fixins and the bun in place on top. The batter was crunchy on the edges, but the middle and inside could be described as "fluffy", something rarely seen in pork tenderloins. Served with all your fixins to stack under a toasted flour-dusted bun. Overall 8.7 out of ten. 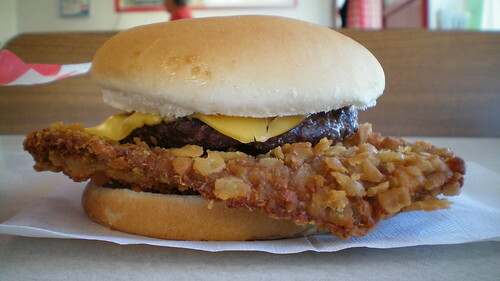 Price: $8.50 with side of fries. Also on the menu: The menu has the comfort food classics like Iowa Chop, Cured Ham, Meatloaf, and pies along with some of the usual stuff you see everywhere. The Checkered Flag menu has sports bar items and a Pork Chimichanga. Service: The restaurants owned by the Heart of America Group are a lot of things, but they are all fast, efficient, clean, can handle groups and you never need a reservation. I think they serve any item from the Checkered Flag or Gramma's Kitchen in both dining areas. Ambiance: I didn't have time to dine in, but there is a gift shop area in front of reception with Iowa and farm-themed stuff for sale. The dining are is made out to look like some imaginary Gramma out there somewhere. There is another entrance to the building with an entirely separate restaurant, the racing themed sports bar-like Checkered Flag. Final Thoughts: Gramma's Kitchen may have the most convenient location of any tenderloin in Iowa. Smitty's in Des Moines is close to the airport, but more people drive through Iowa on I-80 than any other way through Iowa. The truck stop across the street is very busy year round. Gramma's Kitchen is not a small-town mom-and-pop place, but their professional culinary team had put together a competitive loin.